Idiopathic pulmonary fibrosis (IPF) is a chronic diffuse lung disease characterized by an accumulation of excess fibrous material in the lung. Protease nexin-1 (PN-1) is a tissue serpin produced by many cell types, including lung fibroblasts. PN-1 is capable of regulating proteases of both coagulation and fibrinolysis systems, by inhibiting, respectively, thrombin and plasminergic enzymes. PN-1 is thus a good candidate for regulating tissue remodeling occurring during IPF. We demonstrated a significant increase of PN-1 expression in lung tissue extracts, lung fibroblasts and bronchoalveolar lavage fluids of patients with IPF. The increase of PN-1 expression was reproduced after stimulation of control lung fibroblasts by transforming growth factor-beta, a major pro-fibrotic cytokine involved in IPF. Another serpin, plasminogen activator inhibitor-1 (PAI-1) is also overexpressed in fibrotic fibroblasts. Unlike PAI-1, cell-bound PN-1 as well as secreted PN-1 from IPF and stimulated fibroblasts were shown to inhibit efficiently thrombin activity, indicating that both serpins should exhibit complementary roles in IPF pathogenesis, via their different preferential antiprotease activities. Moreover, we observed that overexpression of PN-1 induced by transfection of control fibroblasts led to increased fibronectin expression, whereas PN-1 silencing induced in fibrotic fibroblasts led to decreased fibronectin expression. 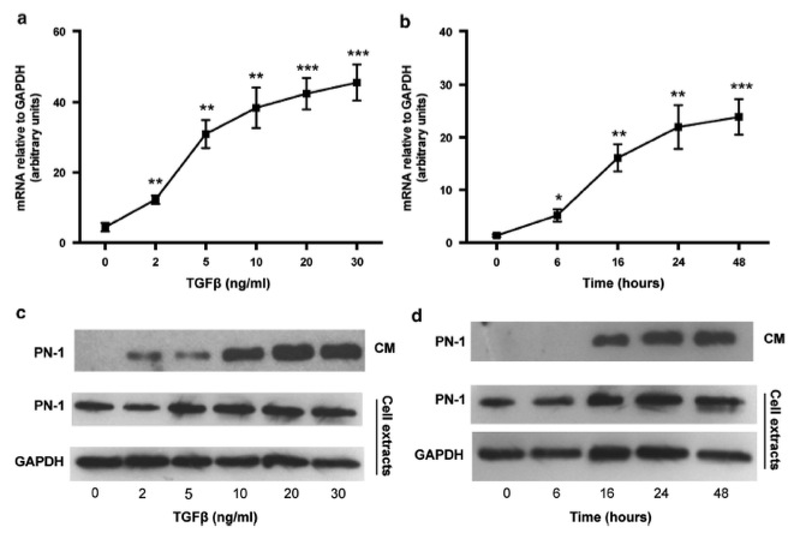 Overexpression of PN-1 lacking either its antiprotease activity or its binding capacity to glycosaminoglycans had no effect on fibronectin expression. These novel findings suggest that modulation of PN-1 expression in lung fibroblasts may also have a role in the development of IPF by directly influencing the expression of extracellular matrix proteins. Our data provide new insights into the role of PN-1 in the poorly understood pathological processes involved in IPF and could therefore give rise to new therapeutic approaches.